It was perfect. Lovely, informative and to our pace. This was a thorough tour covering Harvard Yard but also American history. Ted wove the history of Harvard University from the early colonists to modern day. He took into account what we had heard on our walks along The Freedom Trail in Boston to add more depth to a modern understanding of not only one university but to a country as a whole. An interesting presentation of a small tract of land which has had an impact on the country and the world. Highly recommended whether you're a Harvard fan or not. Very knowledgeable, you leave with a great understanding what led up to the first shot heard around the world. You visit the sights with a play by play leading up to the Civil War. Would book again with this guide. TOUR GUIDE RESPONSE: thanks so much, it was a pleasure to spend time with your family. Ted is very knowledgeable, has great communication style and nice to be with! A great tour of Boston and the an even better education of it's history. We were there on a cruise ship stop, and Ted was on time and easy to find, and had us back to the dock with no issues! Ted is a great tour guide and I would definitely recommend him to my friends and family or anyone who wants to learn about the great city of Boston! We had a fantastic tour and walk through the fascinating history of Boston and the Commonwealth with Ted. He was most accommodating, in customizing the tour for us and happy to discuss all aspects of the rich history of the founding of the city and its now infamous characters. TOUR GUIDE RESPONSE: Thank you so much for the kind words, hope to see again in Boston some time. We thoroughly enjoyed our day with Ted. He kept our family entertained and engaged. Highly recommended! TOUR GUIDE RESPONSE: Thank you so much for your kind words, hope to see you in Boston again some day! Ted was an excellent guide. 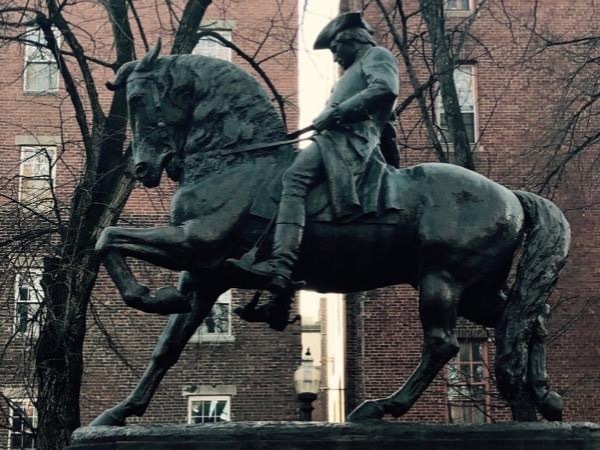 His descriptions of the characters and places of the American Revolution in Boston made the history come alive as we walked the streets and allies where it all took place. He was super-knowledgeable but never pedantic, and his style and depth worked equally well with history minded adults as it did with our five teenagers. We've worked with a number of guides in many different places, and Ted is among the best. Ted was knowledgeable of the revolutionary history of Boston. He added interesting facts and welcomed questions. Even though it was a terrible day weather wise (pouring rain), Ted made the tour fun and interesting. His knowledge of the history and the sharing of stories made a dreary day very pleasant. Ted was very knowledgeable and we could tell really enjoyed giving us the tour. He loves the history! Absolutely magnificent... who knew Harvard was much more than University? Such an influence on America and American History. Ted was fantastic, nothing was a trouble he knew his stuff and made it a pleasant way to stroll through the hollow grounds and feel part of it. I even want to go back to University :) ! Thank you so much Ted for a fantastic tour. What an enjoyable tour! Ted really knows his history and he explained things in a way that was interesting and thought provoking. We highly recommend his tour. The tour with Ted was terrific. He was knowledgeable, and very pleasant . Perfect pace with answers to all our questions. I wish he was traveling with us. Great info... very intuitive to our individual Group needs. We thoroughly enjoyed Our tour, our day, and especially our Choice of guide. We had a lovely time with Ted on our visit to Harvard. It is one of those places you absolutely must get a guide if you really want to understand the place and all of its complex history. Sure, you can walk around and look at stuff, but having a guide like Ted will enhance your experience in a way you can not do yourself. Ted had a bit of a task trying to keep our whole multi-generational group entertained, but he passed with flying colors! Our only regret is not having more time with him! Ted was great! He is so knowledgable of Boston's history and nuances. You will get more intimate details of the Revolution than other city tours. I have done other walking tour and bus tours and it didn't even come close to covering the historical details Ted revealed. This tour was one of our favorite parts of the trip. He was very patient with our younger kids and take the time to answer any questions. Highly recommend! Wow! What a knowledgeable and friendly personal tour guide. He answered every question with enthusiasm and kept us spellbound with various stories of the early rumblings of the American Revolution and the role that Boston played in these incredible events. Highly recommend! Tour was very enjoyable and we learned a great deal of history, lots of stuff that is not readily known and a deeper dive into revolutionary war chronology and key players. Had a wonderful tour with Ted. His knowledge of history of Boston was impressive. His pace was perfect for the group. I would highly recommend Ted for any future groups that ant to experience a detailed history of Boston. Ted's knowledge of the back stories of the Revolution is phenomenal. There was not a single moment in the 90 minutes with him that I was not enthralled with his story telling. I'd love to experience any other tour he leads, but alas, I may not be able to make it out East again for quite some time. He certainly is a credit to Tours By Locals. in future travels, I'll certainly consider it again. Absolutely fantastic tour with Ted who had an encyclopaedic knowledge of Boston's history which he brought to life for us. We have been to Boston before but this was the best tour we have been on by far. We strongly recommend this tour especially for history lovers. My parents and I Had a great time learning about Boston. Ted gave a great synopsis of the relevant history of the revolution and the important landmarks around the freedom trail. I definitely recommend Ted ! I have always enjoyed Tours by Locals wherever I visit! We really liked Ted's enthusiasm. He was well prepared with interesting stories and facts and made history fun for three teenagers as well as grandma and grandpa. He was able to answer our questions and provide interesting information that we didn't know. The hour and a half was the right amountof time for us because 74 year old grandpa can only walk so far and 3 teenaged boys can only care about history for so long before they want to romp and play. A longer tour would have been too long. TOUR GUIDE RESPONSE: Thank you for the kind words, it was a pleasaure to meet you and your daughter. interesting, informative, and perfect duration of 90 mins. Ted is great to work with and gives a great tour of Boston! Ted is a good guide, full of detailed knowledge of Boston's historical facts. His tour is information packed - so much information, in fact, that it's a bit overwhelming. Be warned that Ted's tour is conducted on foot, on what - for anyone not used to strenuous walking - are physically-demanding hills, both up and down. Also, because you are walking, the history is presented according to where the buildings or sites are encountered en route, rather than in a more coherent, easily-absorbed order.